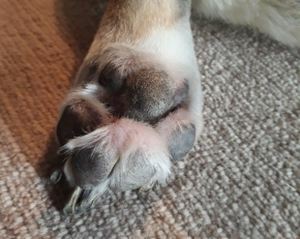 There will now be a paws. Petra (A) wrote "Sorry to read that. My thoughts are with you." Thankyou. Cop Car wrote " I am sorry for your loss and, as SWMBO had written, I'm pleased that you were given a few extra days with Kosmo. (For your "dog people", you might steer them to the photos and words of SWMBO.) Kosmo would be proud of you for seeing through your grief to provide that one last pun. (Yes, I anthropomorphize.)". More photos to follow in a forthcoming SWMBO blog. 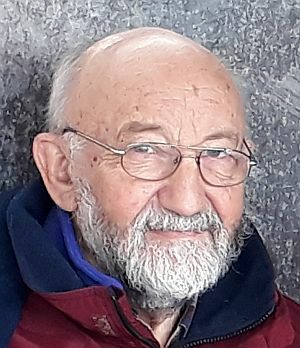 Doug (Canada) wrote "So sorry to hear about Kosmo. Our furry friends are family. We have them for such a short time. Take care!" Thanks, Doug. 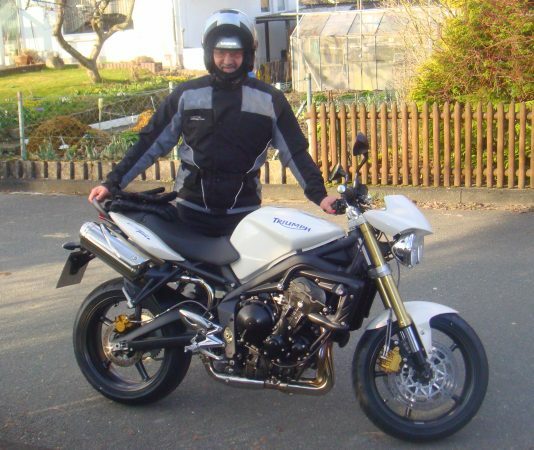 Biker friend Volker (D) wrote "My condolences - I can understand your grief." Thanks, Volker. 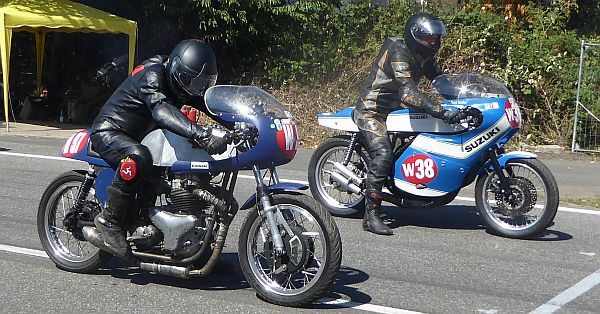 Sunday's motorcycle ride saw five of us ride about 180 km south to Schotten (in the state of Hessen) to see the 30 th classic motorcycle races there. I prefer the solo classes. This is the start T+¼ sec into one of the races. 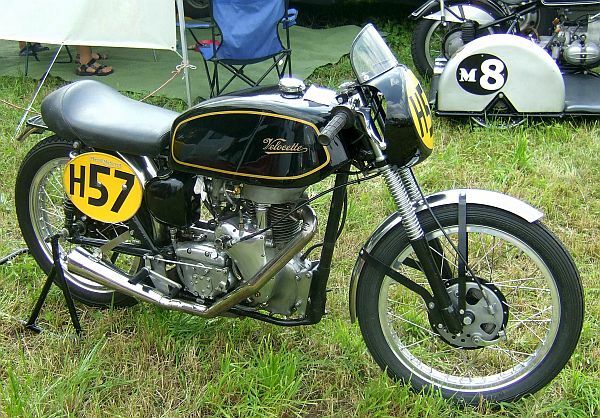 One of the few factory racers there was Siegfried Merkel's (no relation) MZ RE125 dating from the 1963 world championship. 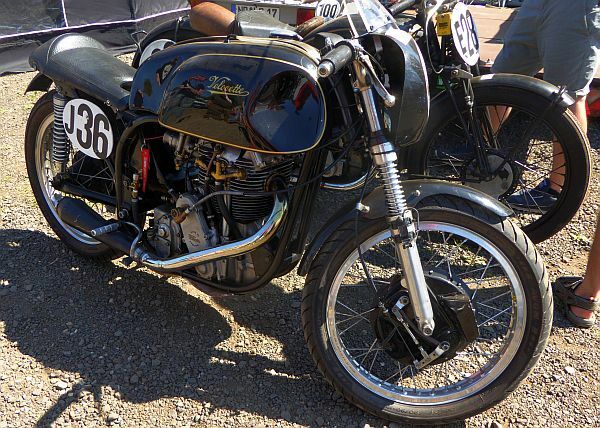 It got about 28 HP from an &frac18; liter single cylinder disc-valved two-stroke. Surprisingly, painted blue not the usual green & silver. 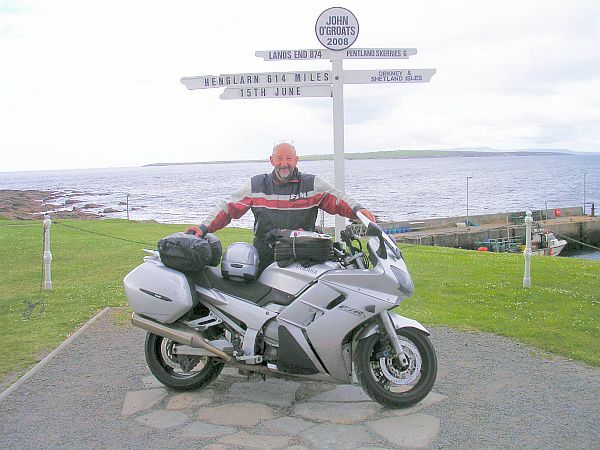 Ed (USA) asks "So how do those last two bikes compare?" 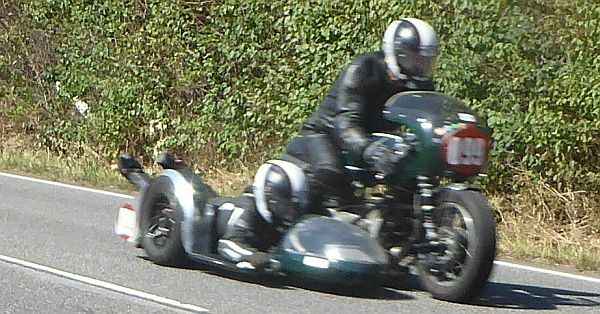 Well both deliver 28 hp. 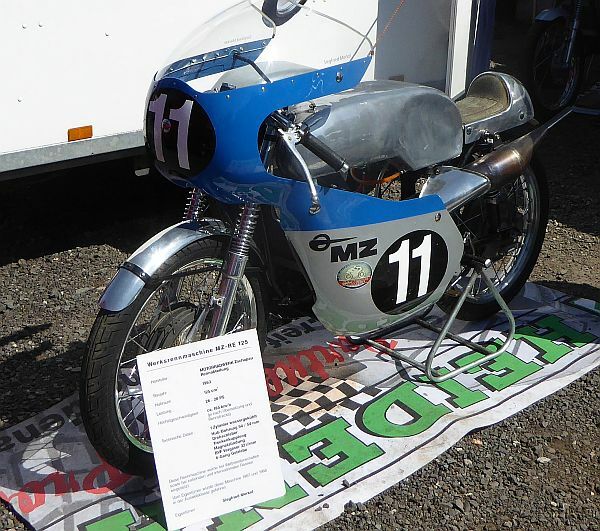 The MZ does so from 125cc, is a 2-stroke single and dates from 1963. 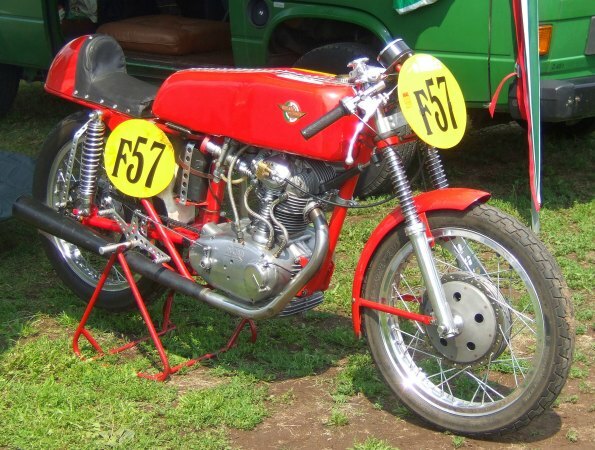 The KTT engine does so from 350cc, is a 4 stroke OHC single and dates from 1938 (frame is a Norton Featherbed from 1952ff). 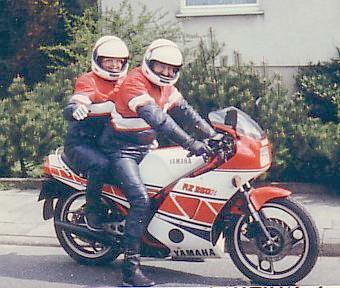 At their peak, racing 2-strokes delivered 400 hp/litre. 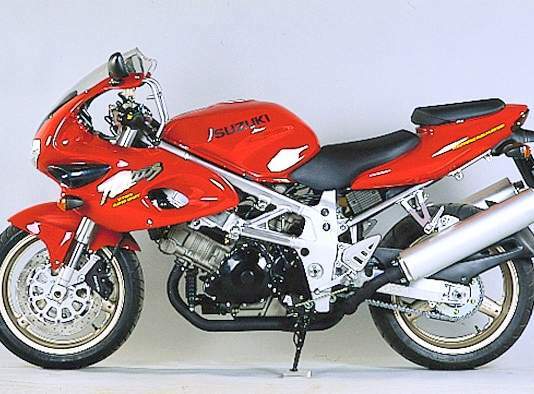 Modern racing 4-strokes (MotoGP) reach 260 hp/litre. 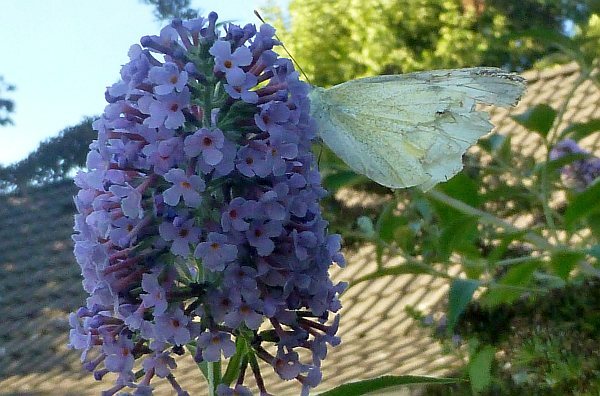 And this one (not two bee) is a Cabbage White butterfly also pollinating the flowers. Cop Car wrote " Your SSIL produced some lovely photos. I've seen many bees (our maternal grandfather and my elder brother kept bees, many years apart); but, that is really up close and personal. I count your SSIL as a talented person with a camera." 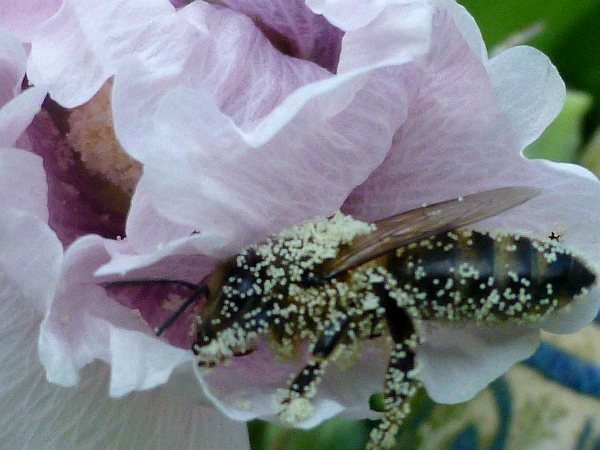 Perhaps your EB can answer my question : what makes the pollen stick to the bee? Honey? 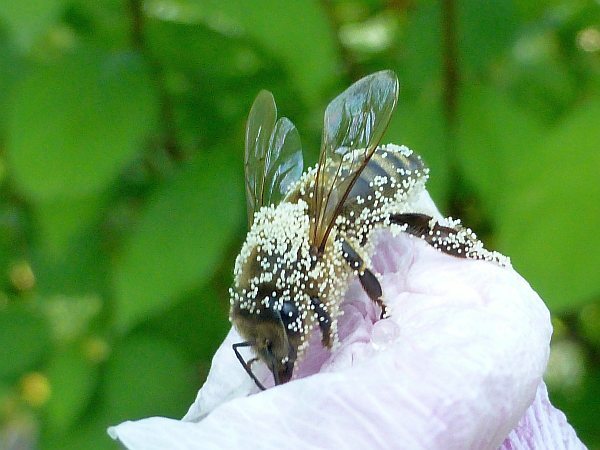 Or is the bee/ pollen naturally sticky in their own rights? Cop Car replied " EB is no longer here; but, I believe static electricity is responsible for the attraction that the hairs on a bee have for pollen grains." Thanks, CC. When I was in Anroechte last sunday (see the Local Fossils Post last week) there was a provincial trade market all along Main Street. Local handymen - builders, roofers, painters etc - each had a stall. Bigger stalls displayed tractors and agricultural instruments, mostly attachments for tractors using standardised interfaces such as rotating shafts, towing hooks, hydraulic lines etc. Even a bank offering finance if you needed to buy a tractor etc. All very provincial. But one of the stalls was run by the local newspaper - The Patriot (established 1848) - pushing their advertising column-inches. However, they have also scanned in 170 years of front pages from their analogue archives. As a free offer, if you told them your date of birth, they would see if they had that day's front page digitised and print out a free copy for you in size A3. So I told them mine, 8th June 1944, just 2 days after D-day, because I wanted to see what the provincial German press was reporting back then. Censored battle-front reports, propaganda, who Hitler had met the day before, and even fake news to pacify the worried population. See below. The first thing I had to get used to was the Fraktur typeface, still popular during the Nazi era, which made it a little more difficult to read. 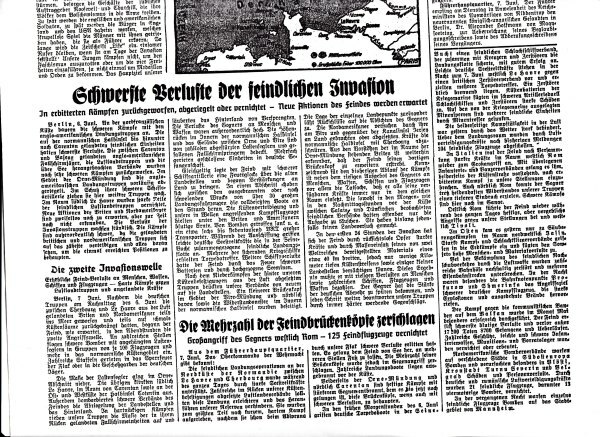 Translation, to show you the way the German news was slanted at the time :- "Geneva, June 7: The bloody sacrifice that the Anglo-Americans have made with the invasion is the price that Roosevelt and Churchill pay to Moscow..." The propaganda blames Stalin - at the Teheran conference - for forcing the Anglo-Americans to invade , presumably to ease the pressure on the East Front. The map of the English Channel does not show where the invasion was happening (Omaha beach etc), nor does it give numerical estimates of the forces involved. I assume this information was classified or they did not want to upset the local German population. The lower articles claim the invaders had been mostly pushed back into the sea and had suffered heavy losses. However the article does admit to a 40km wide bridgehead still on land. No mention of the German losses nor of the absence of the Luftwaffe. The tone of the article is very much heavily edited news and propaganda. 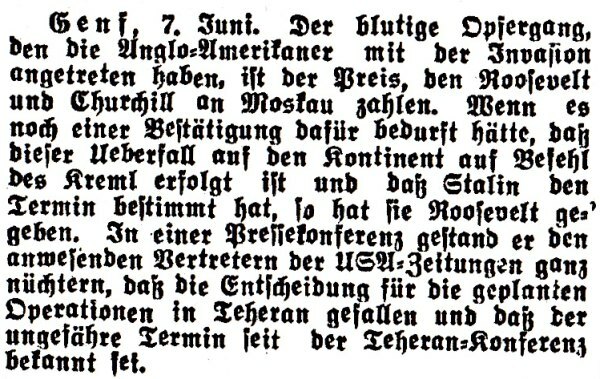 To make things appear diplomatically normal - what, me worry - there were excerpts from Hitler's timetable for June 7th. He received the Hungarian President, the new Kroatian consul, and some other diplomat who had been swapped out. Three or four column-inches were devoted to the Allied invasions of Italy, the Balkans and Tallin (Estonia). A short list of the foreign towns bombed but no mention of any bombing of the Fatherland. A count of the Allied planes shot down, but no report of any Luftwaffe losses. I found it interesting to see this WW2 propaganda and (partial) reporting. Better than the History channel, because uncompressed and REAL history. 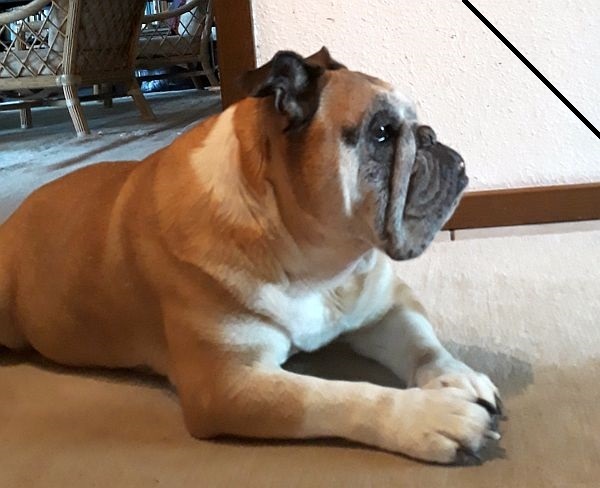 I also gave the newspaper people SWMBO's birthdate, but there was no front page archived for that day :-( By that date in 1945 the Allies would have rolled over the Anroechte area on their way to Berlin . . . hence no German newspaper. 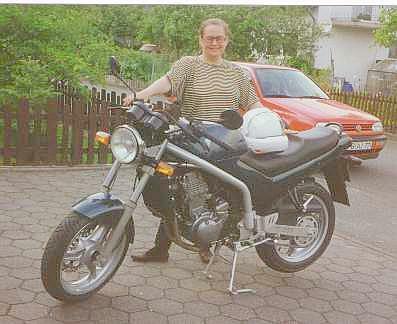 My mailserver was down yesterday so Cop Car wrote in her own blog as a reply to a comment of mine there " Undoubtedly, among my friends, your birthday was on the most exciting of their birth days. 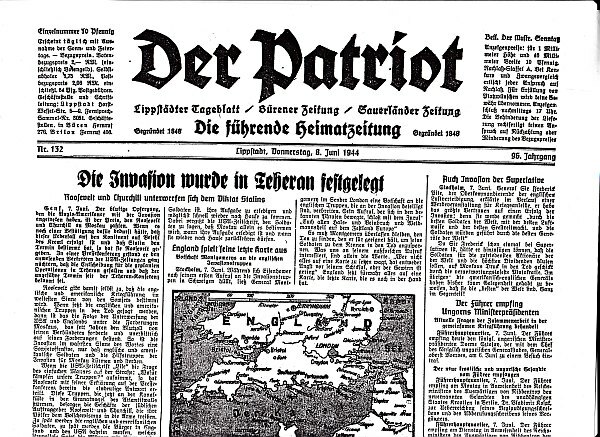 How great that you obtained the front page of Der Patriot; but, if you’ve not already done so, you might seek one from a newspaper that was nearer your place of birth. Most news of the war was slanted - not only for purposes of maintaining morale but for security. Just two days before your birth, a Tulsa newspaper had the headlines shown at: https://goo.gl/images/siyuuY. I lived in Tulsa, at that time." It was by pure chance that I got it for that date. Effortless. Maria (D) says "I have problems reading that font nowadays." Because you are young. Like I have problems reading stuff written in Sutterlin. The Greek God of Irony - Momus - was eventually expelled from the company of the Gods on Mount Olympus because of his sharp-tongued spirit of (unfair?) criticism. So we only rarely hear from him. His place was taken in ancient Greek theatre by Eiron - hence our word Irony. 90million years ago this place used to be a sea. 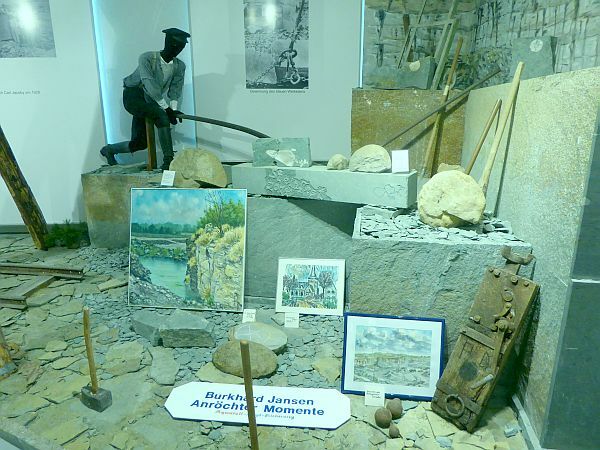 And just 30 miles west of here lies the small town of Anroechte which has a huge quarry and its own quarry museum. So on sunday I rode my trusty motorcycle a half-hour over there to look at any fossils in the quarry museum which is only open for 3 hours on the first sunday of each month. 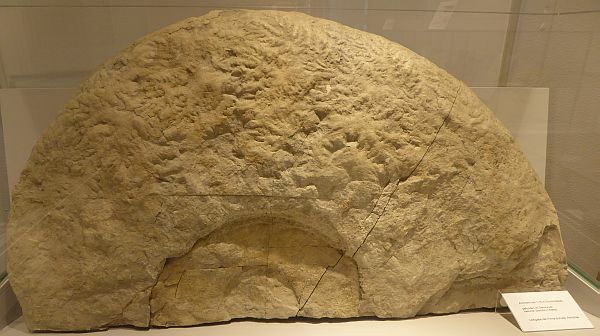 The first half of the stone quarry museum documents how the stones were/are quarried, cut into oblong blocks for e.g. gravestones, carved into statues or ground up for use in road-making. Not very interesting for me. Much more interesting - and the purpose of my visit to see - were the various fossils found embedded in the stones there. 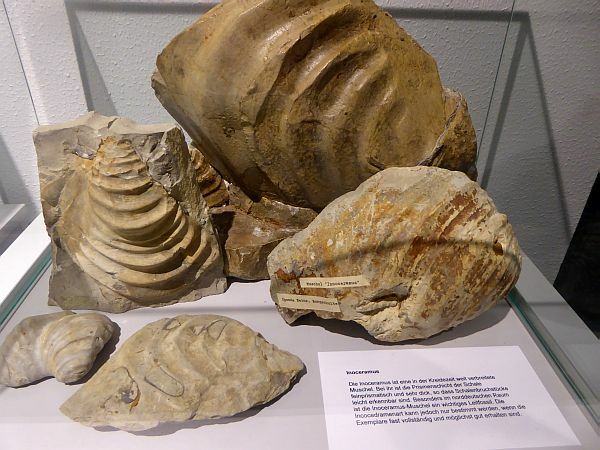 This fossil - five feet across - is an Ammonite (a sea creature from 90 million years ago) rather like the modern Nautilus. At the top are also ferns and leaves from back then. 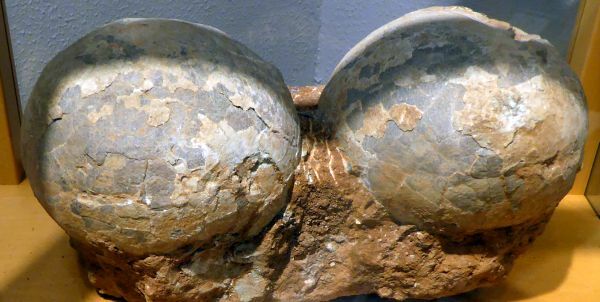 The next exhibit showed Dinosaur eggs, type and age unstated though :-( Each of them is about a hand-span across, a bit bigger than an ostrich egg. Quite impressive too are the Inoceramus mussels, up to a foot across. 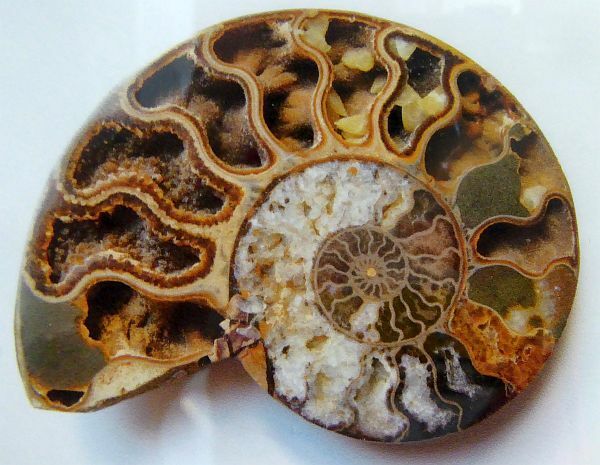 Finally - very decorative - a small 4 inch ammonite , halved and polished. Cop Car wrote " Back from the un-dead! How nice that you have such a museum so nearby. Interesting." It is quite small though, I was through it in about half an hour. The JU 52 shown above was built in the thirties, restored and flown by the Swiss air force, later restored and flown by Ju-Air as one of three. No more details available (to me) yet, so we shall have to wait for this afternoon's press conference and later the full accident report. Condolences to all relatives of the 20 dead.